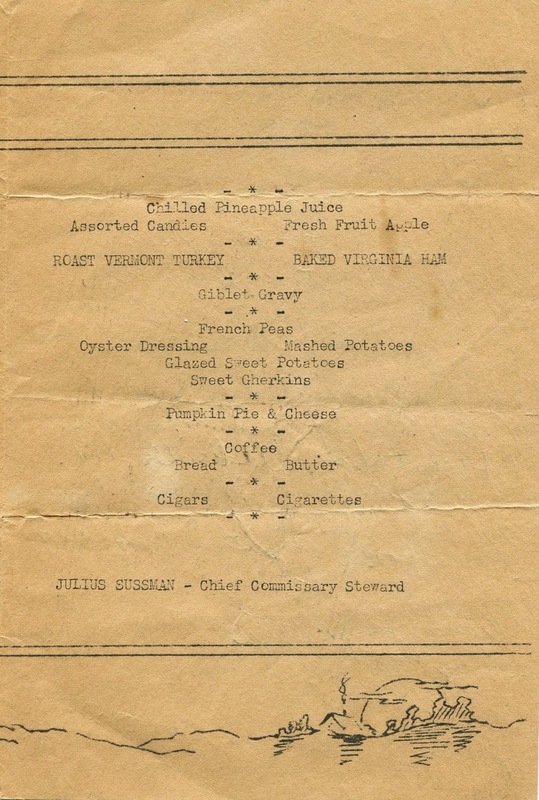 Civilian menus often reflected some aspect of the war. 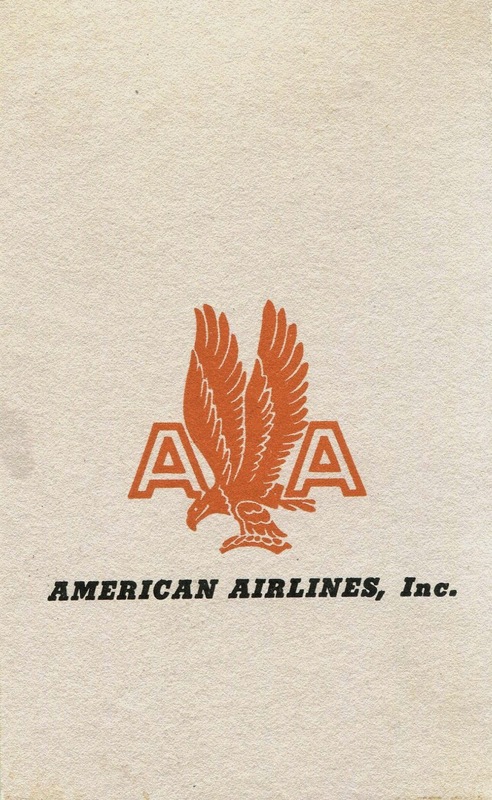 Recalling the days when in-flight meals were a regular feature of domestic air travel, the small menu below from American Airlines shows a formation of military aircraft flying over a quiet hamlet. 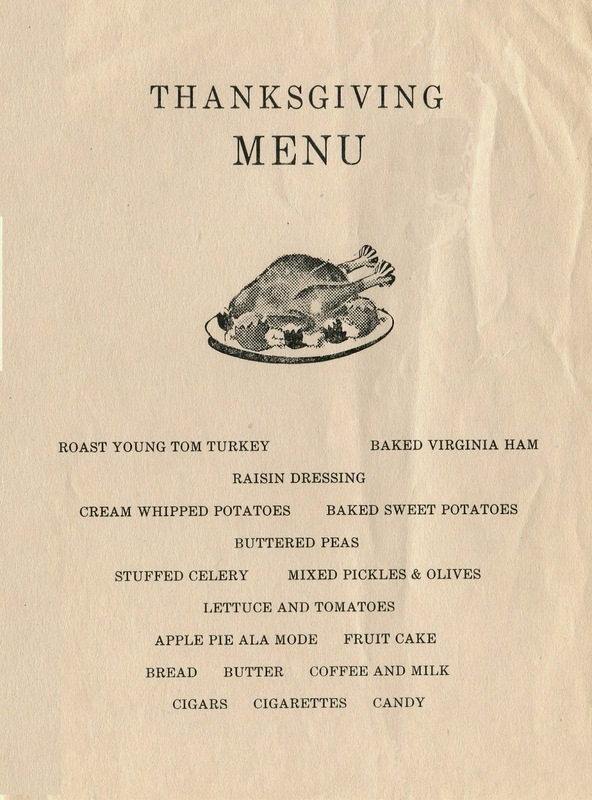 Many of the menus that survive from the holidays of 1943 originated in the military. 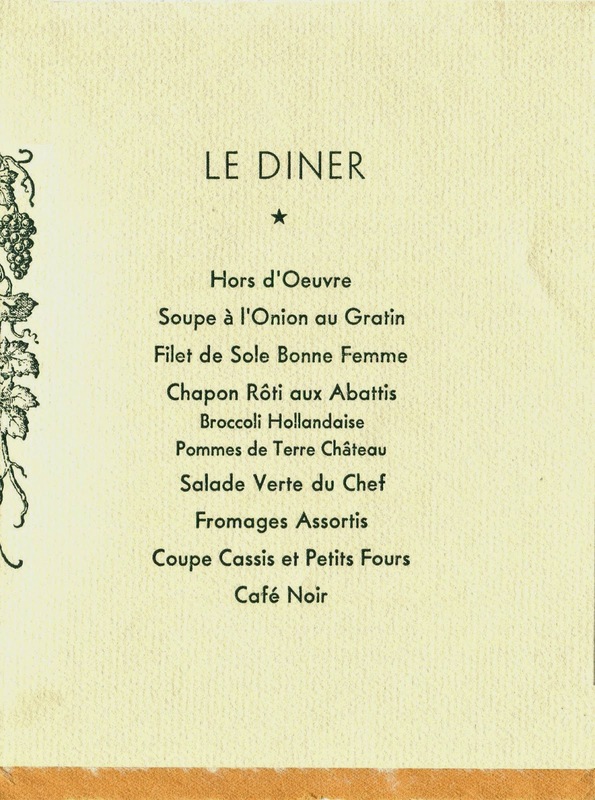 Saved as mementos, these menus reflect the scale and scope of the global conflict. 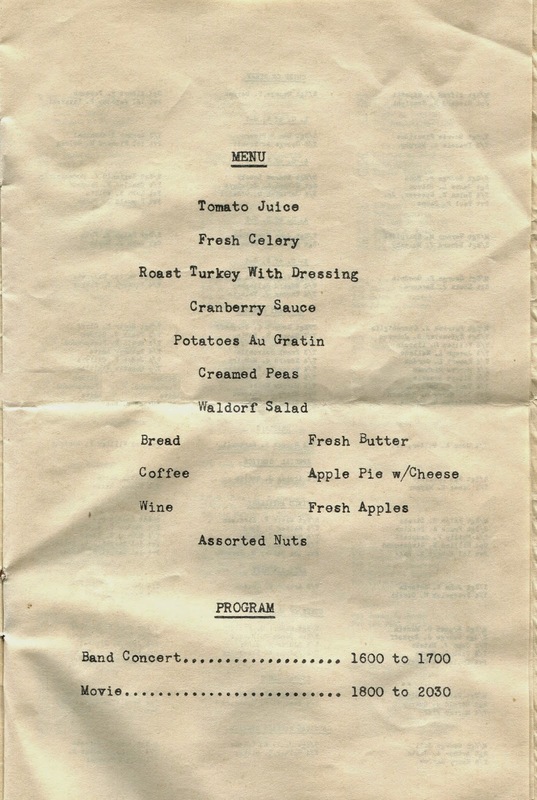 The menu below is from the 120th Naval Construction Battalion (NCB) in North Africa. 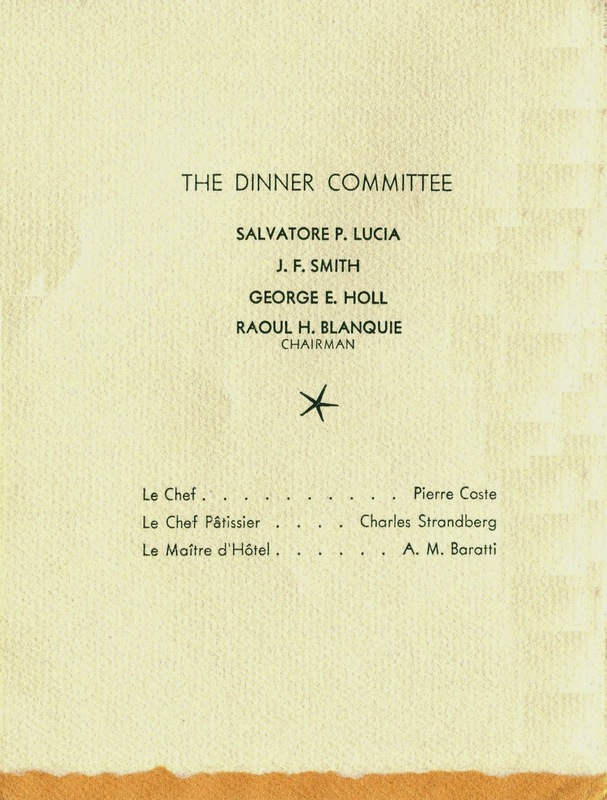 Formed in Casablanca in February of that year, the 120th NCB later relocated to Oran, Algeria, where this modest menu was mimeographed in the Quonset hut. The so-called Seabees carried out construction projects throughout the war, building bases, roadways, and airstrips. The U.S.S. 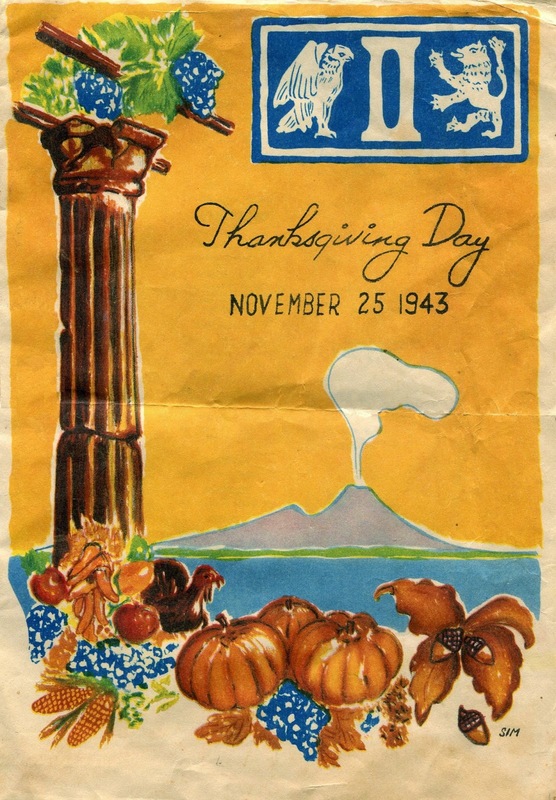 Sturgeon was docked at Pearl Harbor on Thanksgiving 1943. 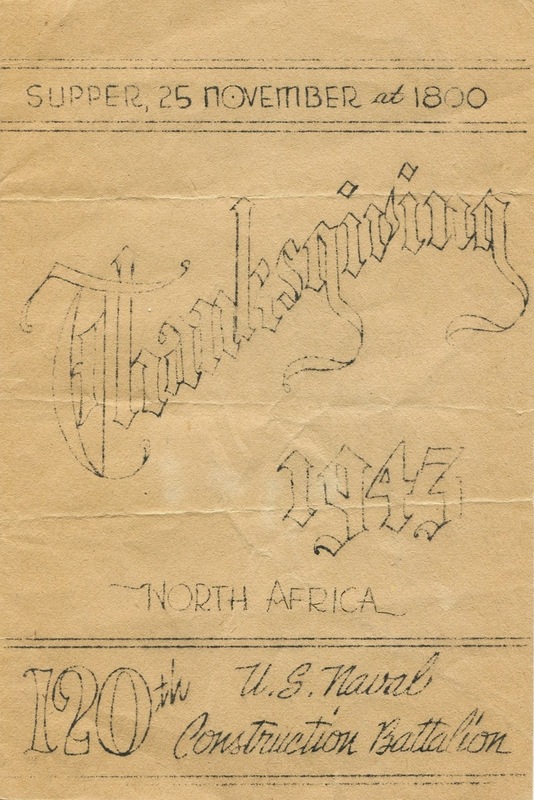 Menus from active-duty submarines during WWII are scarce. The so-called Silent Service comprised less than 2% of the U.S. Navy. In addition, the extremely cramped spaces inside submarines were not conducive to saving things, even small pieces of paper. 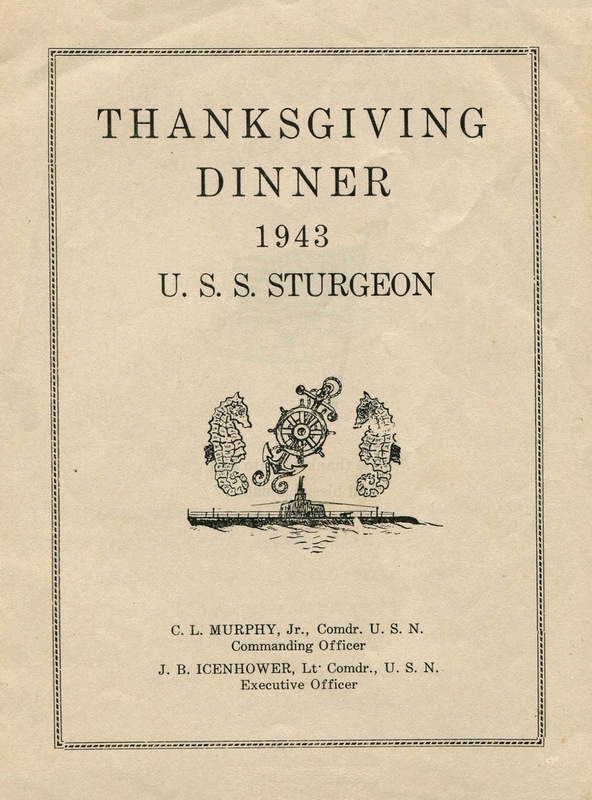 Eighteen days after Thanksgiving, Sturgeon departed on her ninth war patrol, sailing for Japanese home waters. On January 11, 1944, she sighted a seven-ship convoy with four escorts. Finding an overlapping target, she fired four torpedoes, sinking the cargo ship Erie Maru. Forced to go deep to avoid a depth charge attack, the submarine was unable to regain contact with the convoy. Five days later, while operating in the strait separating the Japanese islands of Kyushu and Shikoku, she sank the destroyer Suzutuki, blowing off its bow and stern with two torpedoes. Pinned down all afternoon by counterattacks, Sturgeon cleared the area at 18:55. On January 24, she attacked a four-ship convoy, firing a spread at a merchantman that sent it to the bottom. Two days later, after a fruitless attack on two freighters, Sturgeon returned to Pearl Harbor, via Midway, for refit.3 She was lucky to have returned, for the statistics regarding such wartime patrols are grim. Of the 288 U.S. submarines in service during WWII, fifty-two of them were lost at sea, along with the 3,505 men who manned them. 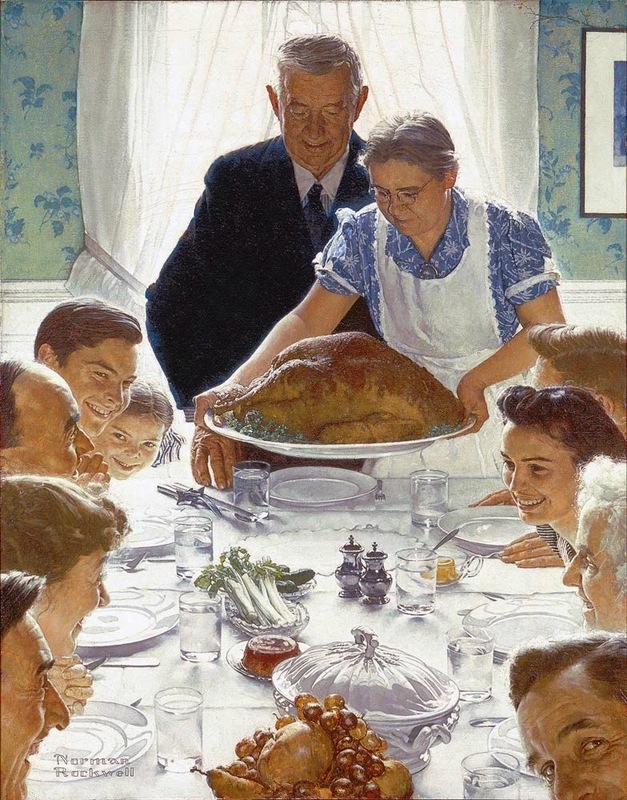 Such was the price of the four freedoms. 1. Chef Pierre Coste was trained in France, and apprenticed in Monte Carlo, Lyon and Paris. 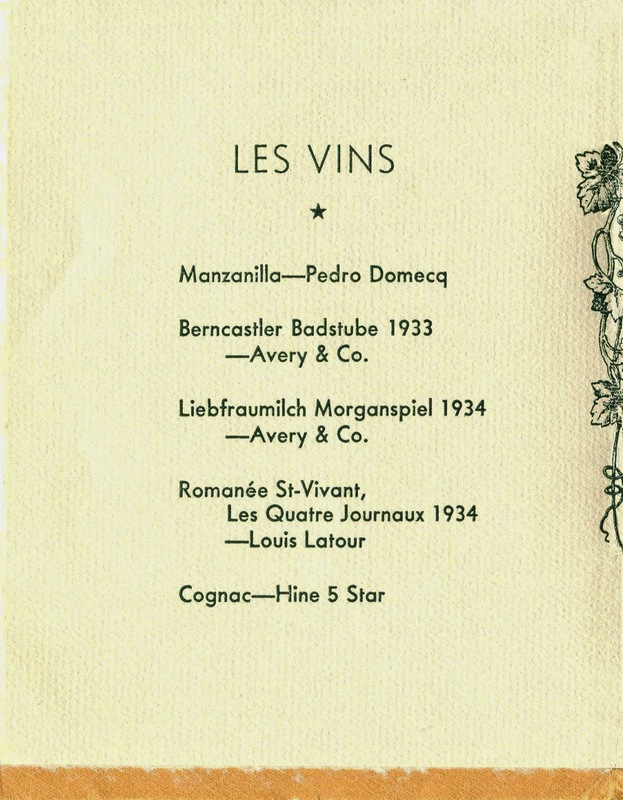 He worked at the Park Lane, Commodore, Sherry Netherlands and Waldorf-Astoria hotels in New York, before being appointed executive chef at the St. Francis Hotel in San Francisco, where he stayed for seventeen years. He later before joined the staff at City College. Today, a dining establishment named in his honor is run by students of the City College Culinary Arts and Hospitality Management Program. 2. Major General Geoffrey Keyes (1888-1967) graduated from the United States Military Academy in 1913. He was deputy to General George S. Patton in Sicily, before becoming the commander of the U.S. II Corps, directing major battles during the Allied offensive from Salerno through the capture of Rome. As a football star at West Point, Keyes was said to be “the only man who could stop Jim Thorpe” on the gridiron. 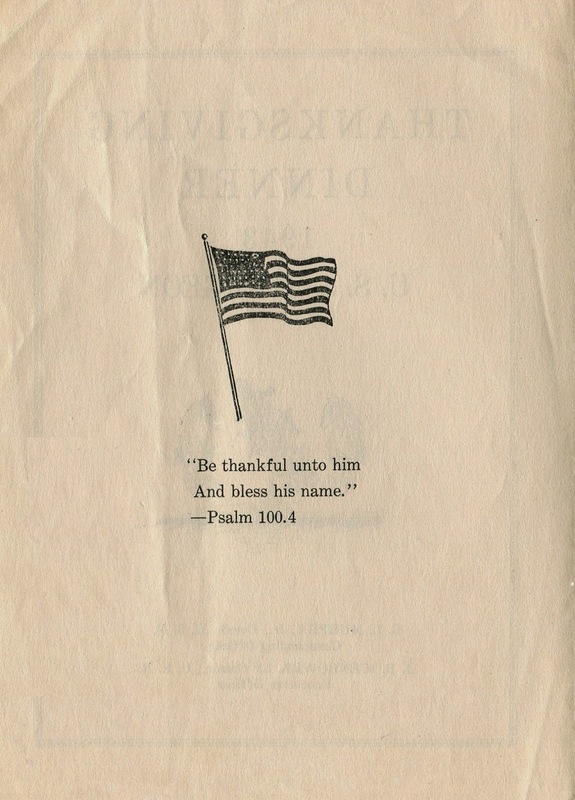 Unfortunately, the scrapbook that Keyes maintained during his years at the Academy was recently disassembled, so that the individual pieces of ephemera, including a number of menus, could be sold on eBay. 3. U.S.S. Sturgeon, Ninth War Patrol (1943-1944), Wikipedia. 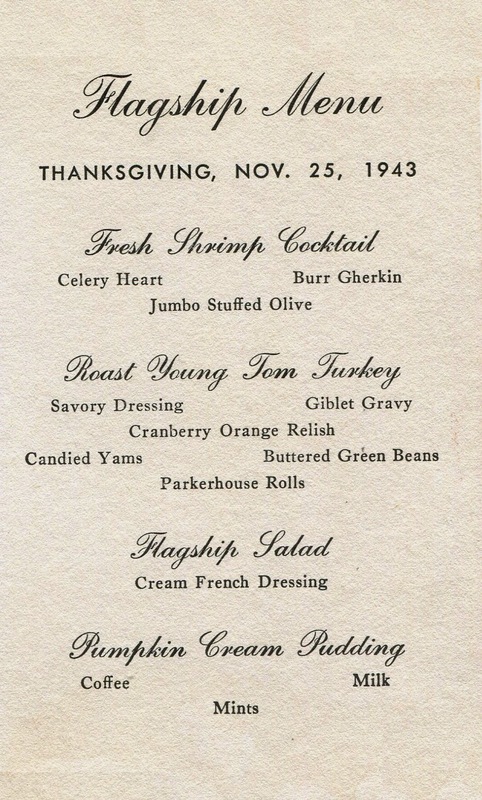 The Seabees menu: first time I've seen candy as an appetizer! Very interesting Henry, well done (as always). 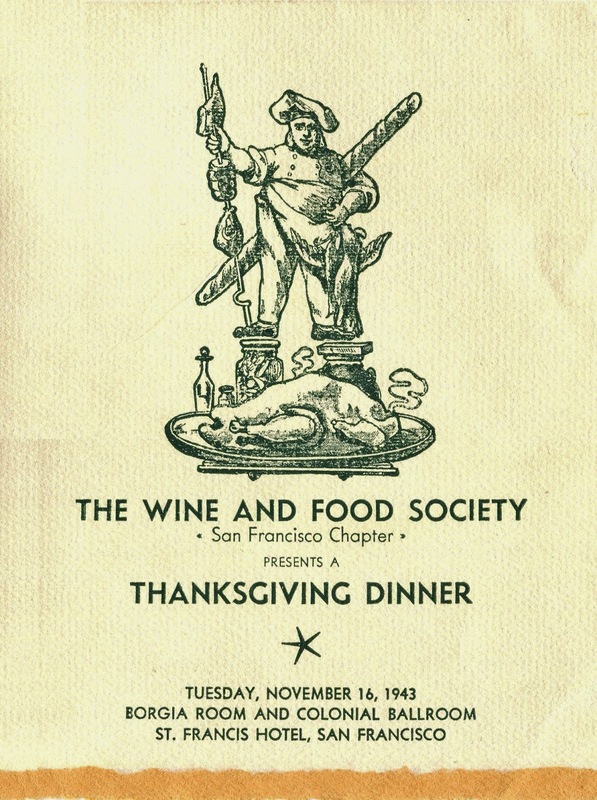 The San Francisco menu has a modern touch ("wine and food society"). 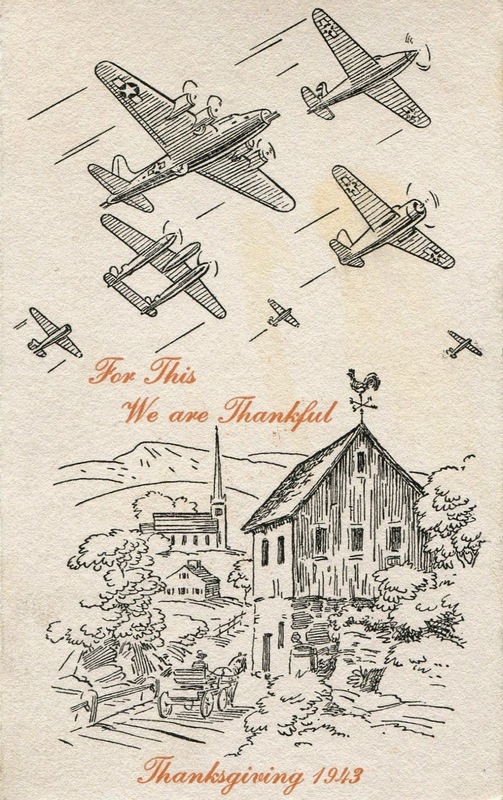 One gathers that wartime preoccupations were somehow not felt as sensibly on the distant West Coast. Not always a bad thing.